What is it about an island that is so intriguing, so special, so alluring? Why is it that an island is so altogether different from the mainland? That the mere mention of the word makes our faces soften and our breath slow down? Why does a piece of land surrounded by water call out to us, creating an intense longing to visit its banks and shores? Hatteras is like any other island in this respect. Its Atlantic Ocean beaches, Pamlico Sound marshes and undeveloped sandscapes call to the weary soul in all of us, promising breath-taking sunrises as a respite for strained eyes, healing salt air to purify stale lungs and warm sand to soften hardened soles. The island calls out to the adventurer in all of us, enticing us with tales of surfing a storm-induced swell, riding the wind with a kite and a board and battling a blue marlin the size of a small bus. 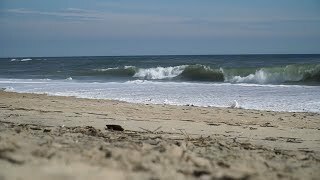 Hatteras calls to the naturalist in all of us, luring us in to see brown pelicans belly-skimming the ocean surface, sea turtle tracks etched into the beach and dolphins arcing their pointed fins in the sea. Hatteras Island is the perfect combination of natural world and vacation world. More than 60 percent of the island is in its almost-natural barrier island state, thanks to the protection of the Cape Hatteras National Seashore and Pea Island National Wildlife Refuge. More than half of the island is open land or cultural sites waiting to be explored. The rest of the island caters to visitors with hotels and motels, rental homes from the luxurious to the simple, restaurants from family style to upscale contemporary, locally owned shops offering just about everything you could need and recreation opportunities for everyone. Thanks to bridges and the state-run ferry system, Hatteras Island is not as remote as it once was. But still, the island is out of the way enough to make going there feel like a veritable getaway. Even northern Outer Bankers, who live less than an hour away, like to escape to Hatteras Island. This is because, for the most part, Hatteras Island has been able to retain its own unique culture and attitude. For its residents and visitors, Hatteras offers a simple lifestyle in tune with nature and connected to the roots of its history. So far, except for two national stores in Avon, superstores and chain restaurants and cookie-cutter consumerism haven’t crossed the waters that surround Hatteras Island. This is not to say that the modern world isn’t slowly seeping in. This is best exemplified in a bumper sticker seen around the island: “Slow down, this ain’t the mainland.” This may be a reference to driving habits, but it applies to much more. 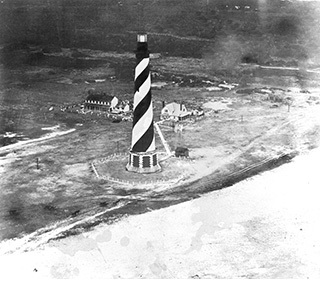 If Hatteras Island is intriguing for what it offers today, it is even more so because of its past. 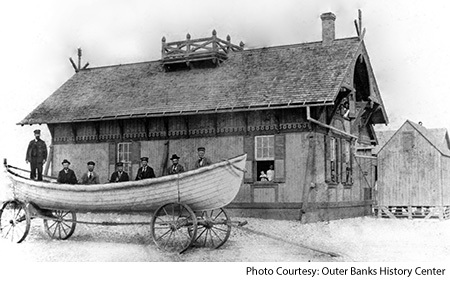 Hatteras’s history speaks of the sea, of lighthouses, shipwrecks on the island’s infamous shoals, the life-saving efforts of courageous locals and the island’s vulnerability in times of war. It speaks of islanders living in what sounds like an idyllic setting with gardens and livestock and the bounty of the sea, but what was really a struggle in the face of hurricanes and the hardships of isolation. 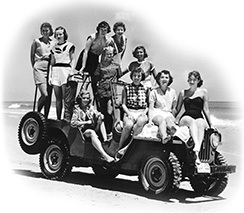 It would be impossible to visit Hatteras Island and not feel the pull of the past. The island’s history is palpable and immediately visible in such structures as the Cape Hatteras Lighthouse, the Chicamacomico Life-Saving Station, the skeleton of an old bridge that leads to nowhere and historical markers by the roadside. But there’s much more to the history of the island than you see at first glance. Look a little closer: family cemeteries tucked into crevices all over the island, wooden boats forgotten in creeks and harbors, old homes fixed up or falling down, the old-timers’ unusual and charming brogue and the hard-to-pronounce Native-American names for the island locations. 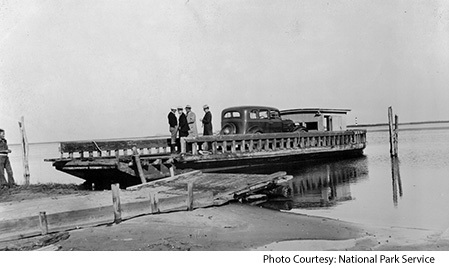 Here are clues that there is more than meets the modern eye on Hatteras Island. 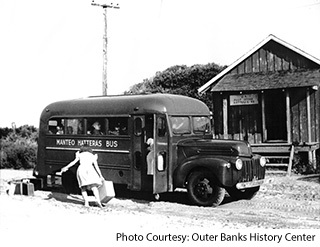 Hatteras’s history is somewhat overshadowed by the island’s new role as a vacation hotspot. Times are changing, and the island will never be the same. But all is not lost. Those who seek out the past and are willing to delve a little deeper into it are rewarded with rich stories and fascinating tales. Try to imagine this island before it was “discovered” by vacationers and recreational fishermen. Stretch your imagination to the time when the oceanfront was barren for the entire 50 miles, save a fishing shack or two. Try to fathom the time when the Cape Hatteras Lighthouse was the only light seen on the entire island. Wrap your mind around the isolation of this island, separated from the rest of the world by miles of open water. 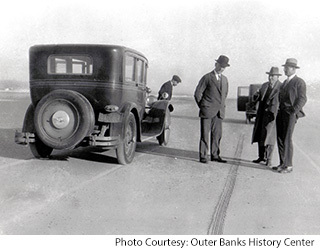 Imagine driving in sandy ruts on the beach instead of the secure pavement of NC 12. But don’t get completely lost in the past. Ask questions if you have them. Notice the care with which old buildings and landmarks have been preserved. Visit the businesses and talk to the people. Explore the present as well as the past.